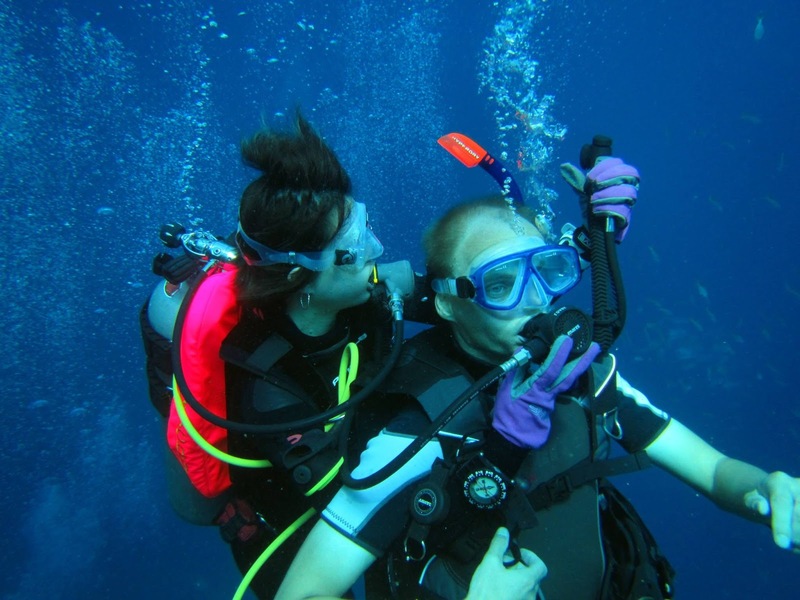 Q: What lead you to decide to take your Divemaster Course with The Dive Academy? Q: Before you began your DM Course you had to complete your Rescue Diver Course with us - did you find it challenging and do you think it made a difference to you as a diver? Yes and yes - It was challenging and it definitely made a difference to me as a diver. When I started I only was 'open water' certified, so I first had to do the 'advanced open water' and compared to the 'rescue diver' the 'advanced open water' are just a few fun dives. The rescue diver course is a very rewarding course, it teaches you how to recognize dangerous or abnormal behaviour/situations and how to deal with them. During the different exercises and scenarios I learned several techniques on how to deal with this. The theory for this course is quite a lot but the exercises and scenarios are the challenging part, it definitely helps if you have a good physical condition.In addition to this training I also did the EFR (Emergency First Responder) training, it teaches you the emergency care procedures which are not only relevant for diving but also in other daily situations. Q: Did the Rescue Diver Course help you at all with your Divemaster Training? I would have to say yes because the Rescue Diver Course made me a better diver in general. After that course I felt more confident and therefore better prepared to start with the Divemaster Training. 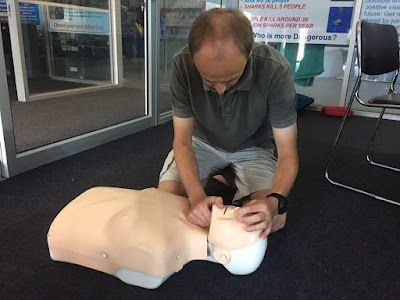 Also some parts from the Rescue course were repeated during the Divemaster Training, like the exercise ‘respond to a an unresponsive, nonbreathing diver’, so indeed it helped to have done it already before. 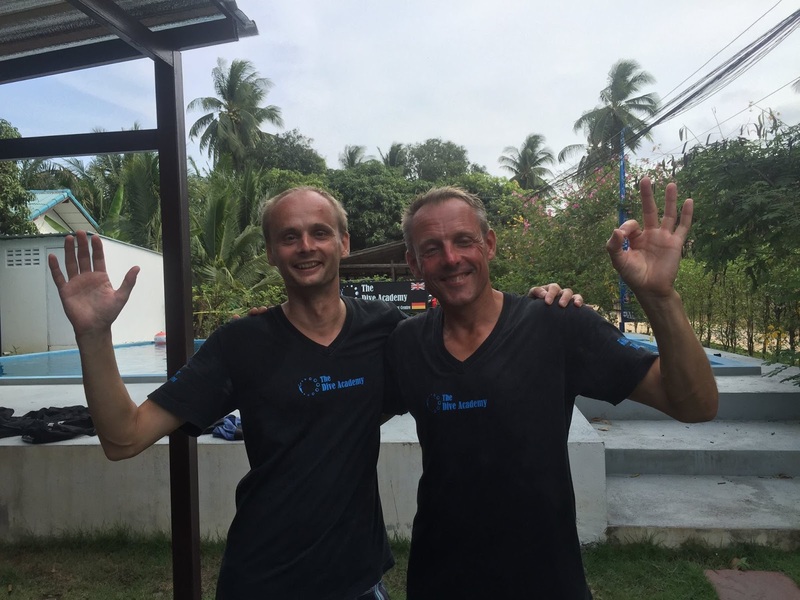 Q: What aspect of Rescue or Divemaster Training do you think had the most effect on you as a diver and do you think you see things differently now you are a PADI Pro compared to being a certified diver? For the Rescue course it were definitely the exercises and the scenarios, the theory was important too but it were the exercises that really prepare you for unexpected situations. For the Divemaster training the focus was mainly on daily activities as a pro; making sure everything is prepared, equipment setup, dealing with the customers, briefings, … As a certified diver you can just enjoy the dive whereas a pro you are involved in so much more! 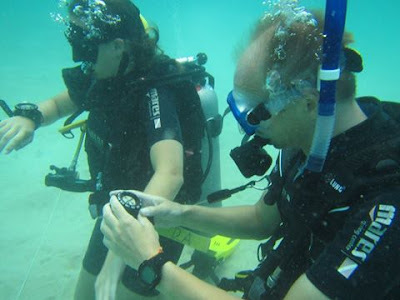 Q: What do you think is the most important attribute or skill you most needed during your Divemaster Training? Besides the general dive skills, it is the people skills that I think are very important. As a Divemaster you come in contact with many customers from different countries, different ages, different experiences, different personalities … and for all of them you will have to find a way to make them feel comfortable and at ease. Q: Did you find working with different instructor's helped you during your DM training? Yes it did, although everybody teaches according to the PADI general standards and procedures, they do have different styles of teaching. Working with different instructors gave me the chance to see all these different styles and learn specific things from each of them. But it is not only about the teaching methods, it is also about their personal experiences that they shared with me. Q: Did you find the training intense or quite relaxed? Do you feel we pushed you hard enough to make you a good Pro or did you find it fairly stress free? Some parts were more intense than others but in general I always had the feeling everything was under control. I never had the feeling that I was pushed too hard, some parts were more difficult but they are the things you will have to deal with if you want to become a good Pro. Q: Do you feel we took you through the course at a good pace that suited your learning or could we have pushed you to get through it quicker or taken even longer? I had the luxury that time was not an issue for me, I didn’t have a deadline or have to finish the training in a specific timeframe. This resulted in a very flexible planning and a win-win situation for all of us, The Dive Academy could schedule me in when it fit best in their planning and I was able to participate in various activities, even if they didn’t occur very frequently. So for me this was an ideal pace. I probably could have done it quicker but I guess it wouldn’t have gone that smooth and would maybe have created some unnecessary stress. Q: How well do you think your instructors prepared you to be a Pro and what can you say about how your instructor mentored and coached you during the course? I was lucky that I already knew the instructors before I started with the Divemaster Training (because of the courses and fun diving I did before). For me this was very beneficial to already have some kind of connection with them. I had the feeling they were already preparing me before I actually started. Becoming a Pro doesn’t happen by reading a book or just doing the exercises, in my opinion you need good guidance, someone that shares his experiences and acts as a good role model, and I really believe my instructor / mentor did a great job at this. Q: Are you ready to face the world as a confident PADI Divemaster? Q: If you weren't returning to Europe do you think you would enjoy life working as either a PADI Divemaster or Instructor seeing as you have had first-hand experience of how much hard work it is being a Pro, taking responsibility for people on a daily basis and making sure they remain safe while under your supervision. And of course the effort that goes in to loading tanks, packing bags and the other less glamorous jobs involved in being a PADI Pro? It is difficult to say if I would enjoy it or not…. I suppose it doesn’t matter what kind of job you are doing, there are always some parts you like more than others. Currently my plan is still to go back to Europe but I will try to involve myself in some diving activities there. Lastly, in the pictures below, you are seen wearing a dress during the party to celebrate you completing the Divemaster Course - can you tell us how much you enjoyed wearing the dress? 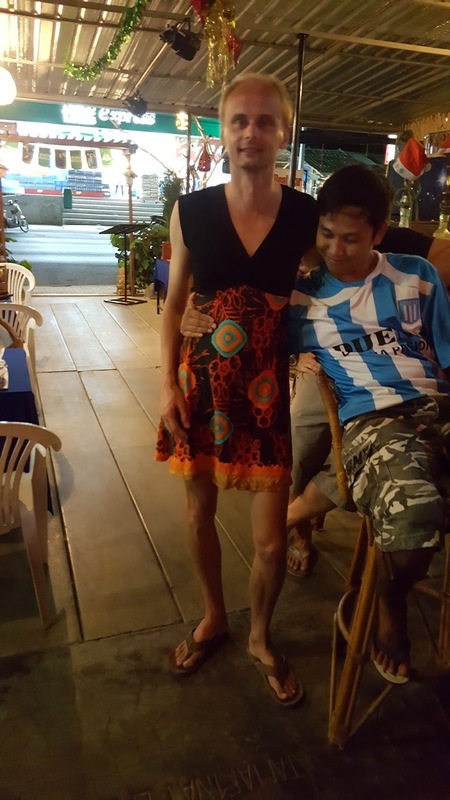 I actually found it very liberating and very comfortable to wear. As I mentioned earlier, during my Divemaster training my Instructors had been excellent mentors and they, particularly Steve, completely prepared me for dressing as a woman by sharing their previous experiences!! 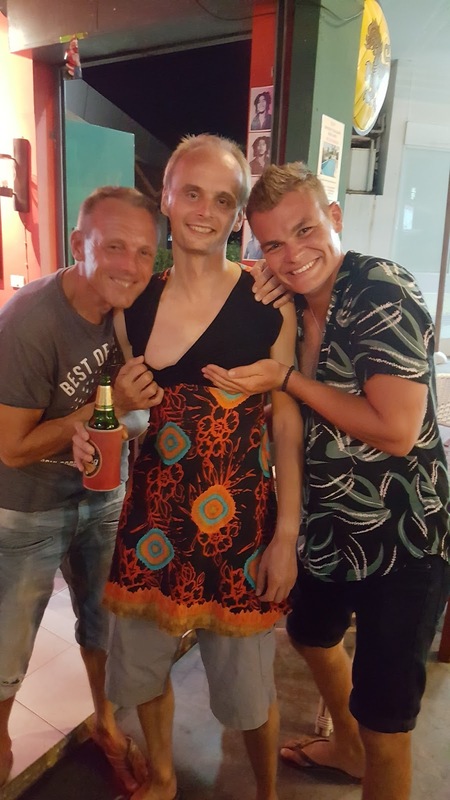 Dan, Steve and driver Sak paying a bit too much attention to Carsten in his dress!! For information about completing your PADI Divemaster or Instructor Course with The Dive Academy, including the very special deals now on offer, contact us for more information.